From his forge in Crabapple, Georgia, about 30 miles north of Atlanta, Michael Dillon coaxes graceful, kinetic forms from enormous pieces of iron, bronze, stainless steel, and other metals. 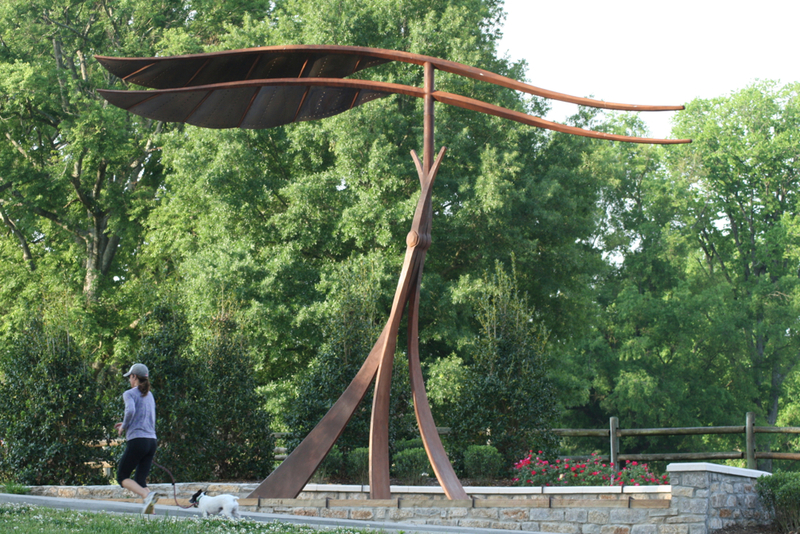 Many of his sculptures allow for some kind of motion, no matter their size: Aileron, which Dillon installed in Nashville’s McCabe Park last year, is a massive, beautiful, curvy construction of two and a half tons of forged iron and bronze, 18 feet tall; its metal feathers respond to the breeze with a slow, swooping horizontal movement. On the smaller end of the spectrum, Dillon’s Avian sculpture depicts the smooth, detailed wing of a bird in flight; a bit of wind or a gentle press will send it spinning 360 degrees. Even his motionless sculptures, like the delicate, wind-kissed Family Tree, often employ studious tapering and bending to imply movement. Want more? You can see Michael's work in person next weekend (March 15-17) at our ACC Atlanta show - find him in booth 903 - and see his Avian sculpure in Michel Boyd's Make Room vignette on site.